The robust code is helpfully commented and should prove to be useful for reference. Later levels introduce cliffs over a poisonous sea and bomb-dropping blimps. 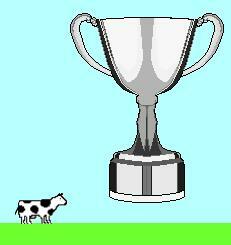 The following is a screenshot from Level Four. The reviewer is not prepared to disclose how many attempts he took to reach this level without cheating! See if you can work out from the code how to use key presses to use the built-in cheat mechanism to start at an advanced level. 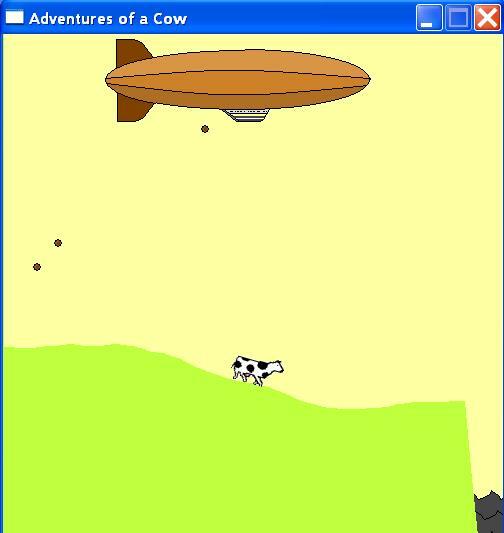 Download here a zip file containing the main code (cowgame.txt) and a folder named associatedFiles containing images and a text file to record the level status. You should unzip the files so that associatedFiles is in the program folder. In order to run the program you will need to use SDL files and additional libraries. (See Getting Started with SDL for download details of SDL.dll, SDL.pas) and other Pascal header files. The program requires the libraries SDL.dll, SDL_gfx.dll and SDL_image.dll. You can put these files in the program folder or with thousands of other libraries in your system folder. Download SDL_gfx.dll from the Freepascal meets SDL site. SDL_image-1.2.10-win32.zip from the SDL_image 1.2 page on the SDL site contains SDL_image.dll. 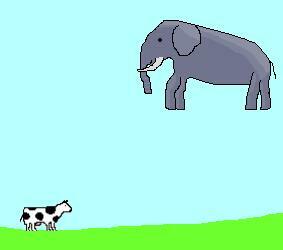 //add a new blimp at random. chance differs for each level. if (random(10) = 1) then //add a new bomb at random times 20!! //between its legs where it touches the ground, at any rotation. Could you use this program to help you to code your own platform game?